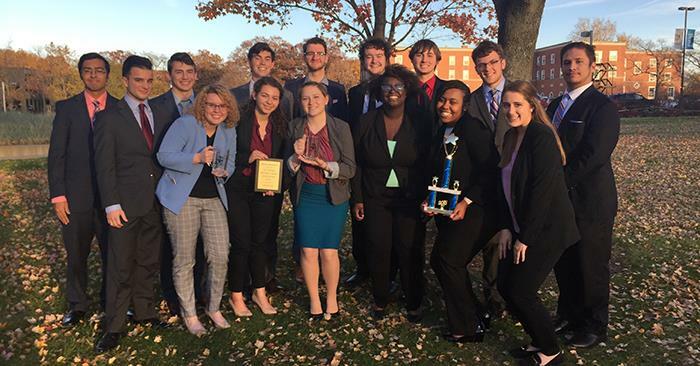 The mock trial team began their competitive season with a successful tournament at Drake University in Des Moines, Iowa, Oct. 27-28. The A team came home with a record of 4-3-1 with eighth place. The B team resulted with a record of 6-2 and third place out of 22 teams. For the first time arguing the civil case, Midlands Television Studios Inc. vs Danny Kosack, both teams were able to bring home hardware from the tournament. Additionally, the team had three members win individual awards. Sage Elfenbaum received the outstanding attorney award on the defense with 19 ranks. Kayla Gerlt and Maddie Petentler both won outstanding witness awards. The team will travel next to the University of Illinois Urbana-Champaign, Nov. 10-11. Mock trial is a student-led organization that competes against other schools across the country through the American Mock Trial Association. Students who are interested in getting more information about the team can email tsumocktrial@gmail.com.